Interior. 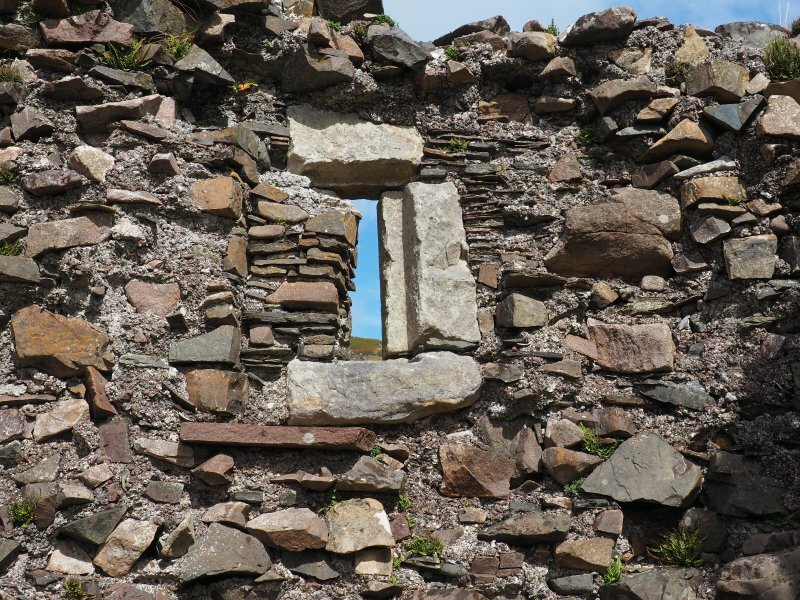 Window in NW room of lower storey. Brochel Castle. View from SW. Interior. ?fireplace in NW room of lower storey. 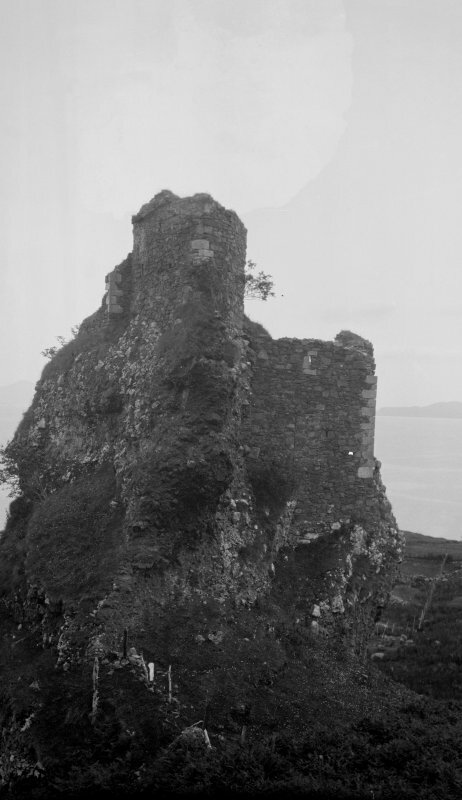 Brochel Castle, Raasay. General view. 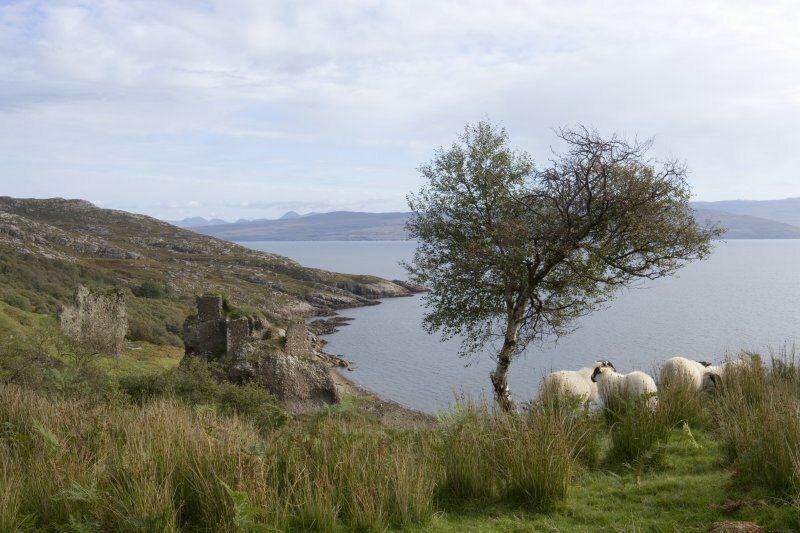 Brochel Castle, Raasay. NE face. Engraving showing general view. 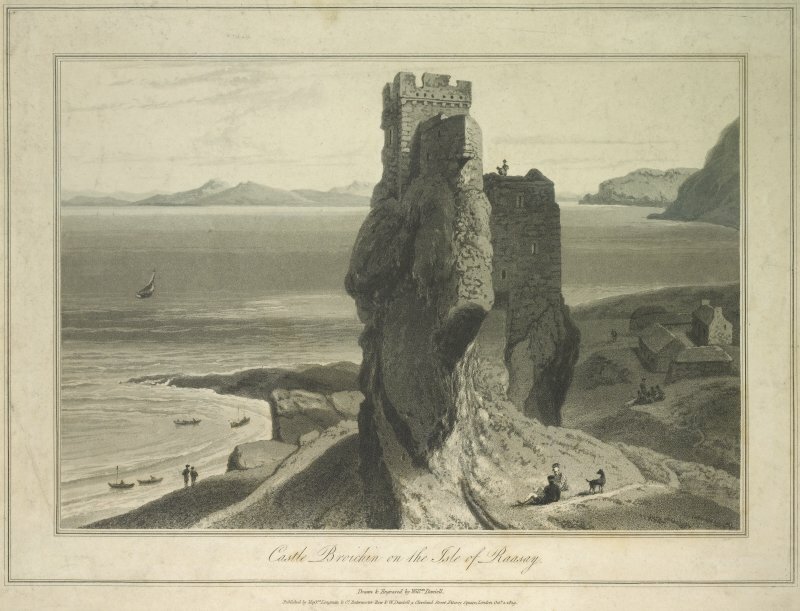 Inscribed: 'Castle Broichin on the Isle of Raasay', 'Drawn & Engraved by Willm Daniell'. 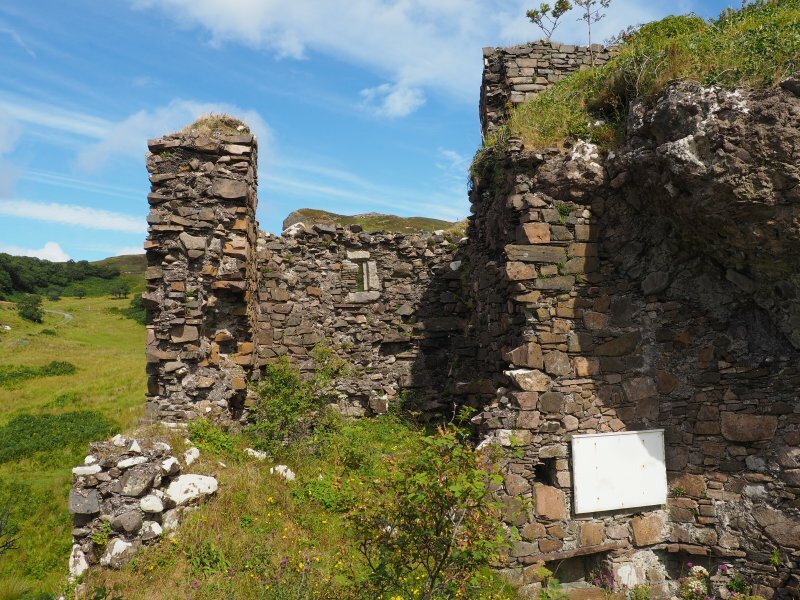 Brochel Castle, Raasay. From north west. 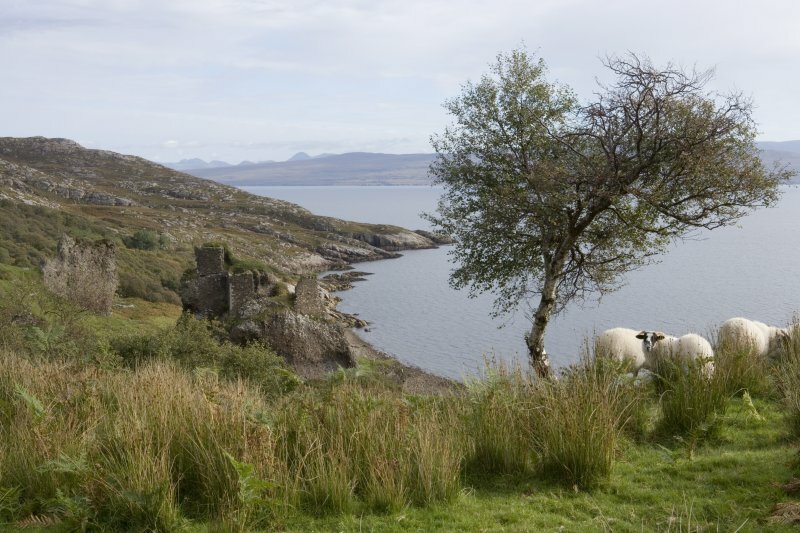 Brochel Castle, Raasay. From west. Brochel Castle. Exterior. 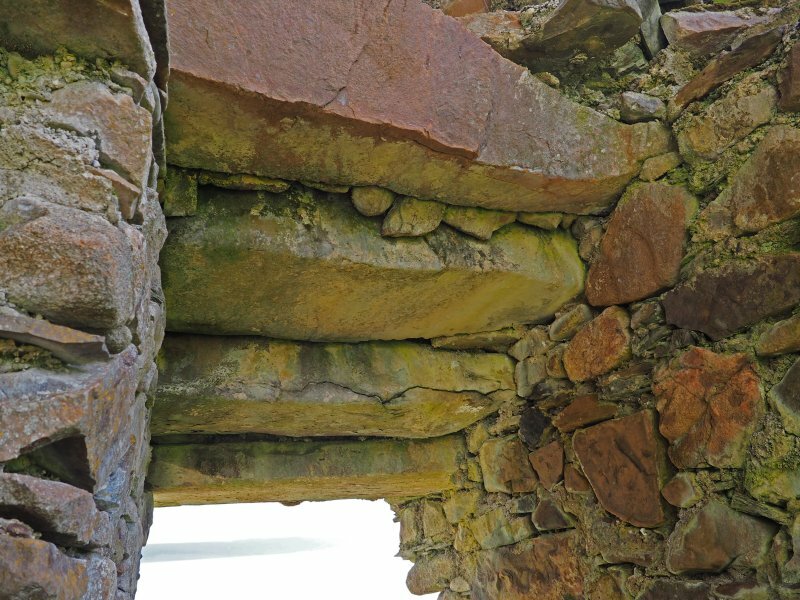 Detail of SW wall and corbels. 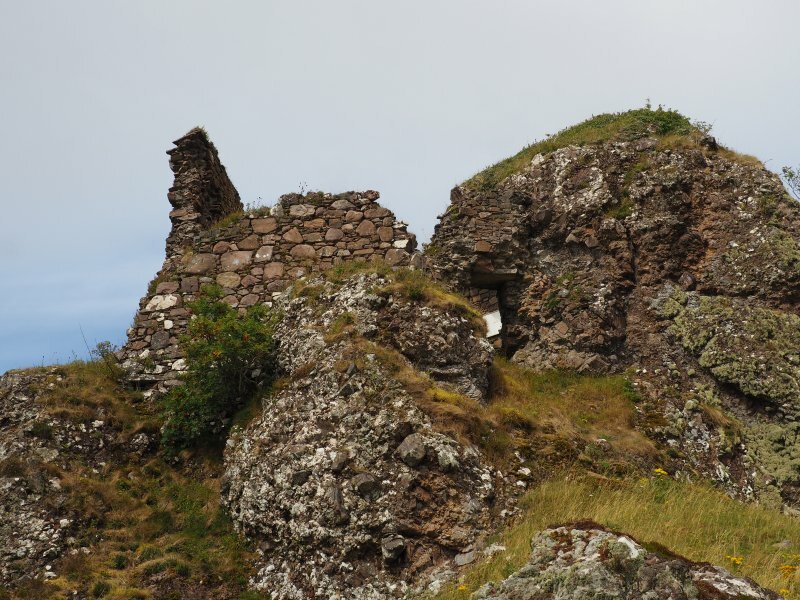 Brochel Castle. Interior. Detail of lintels over entrance passage. 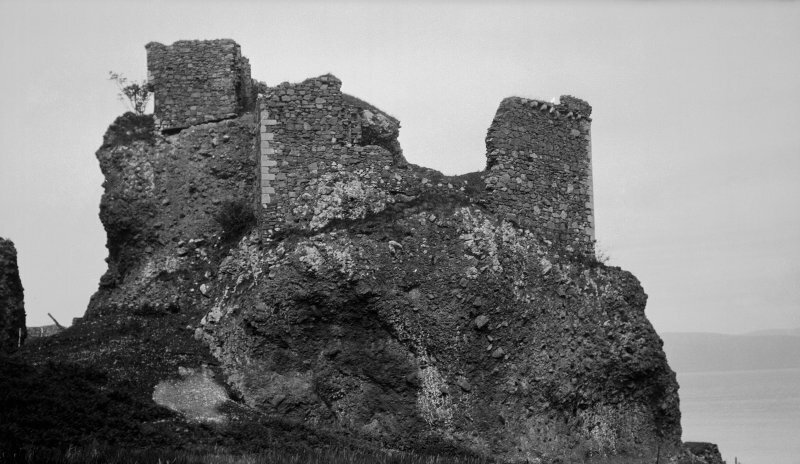 Brochel Castle. Interior. 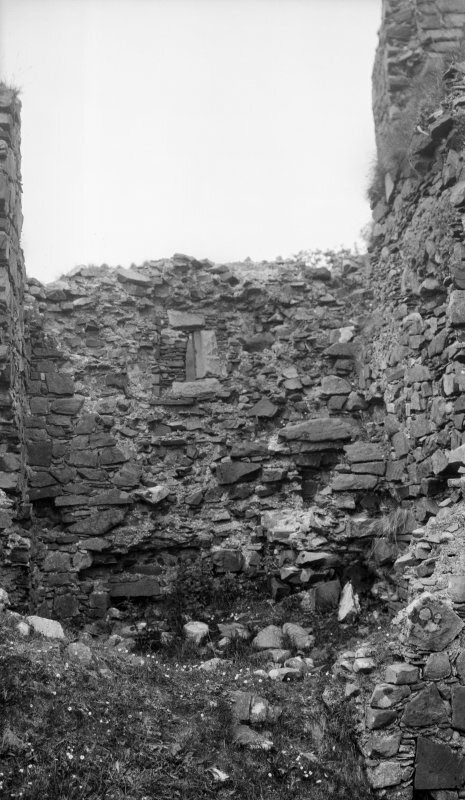 NW room of lower storey. 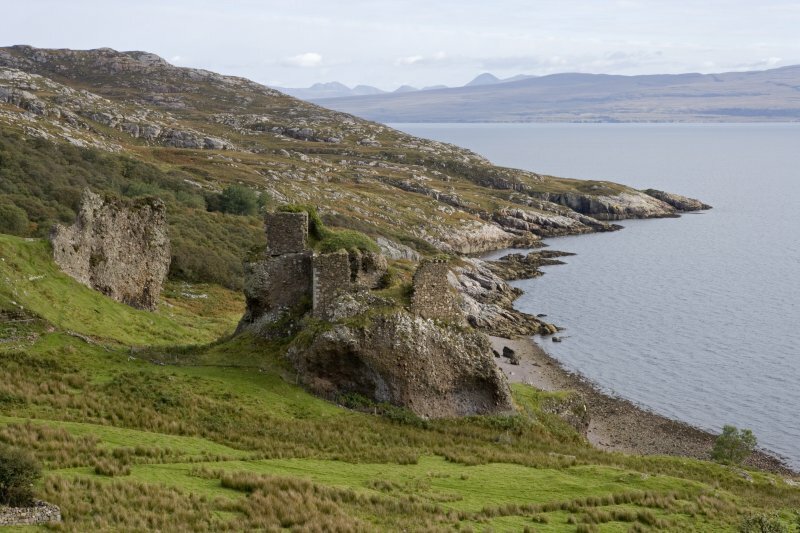 Brochel Castle, Raasay. From south west. Brochel Castle. Interior. Recesses and former information panel in N wall of middle room, lower storey. 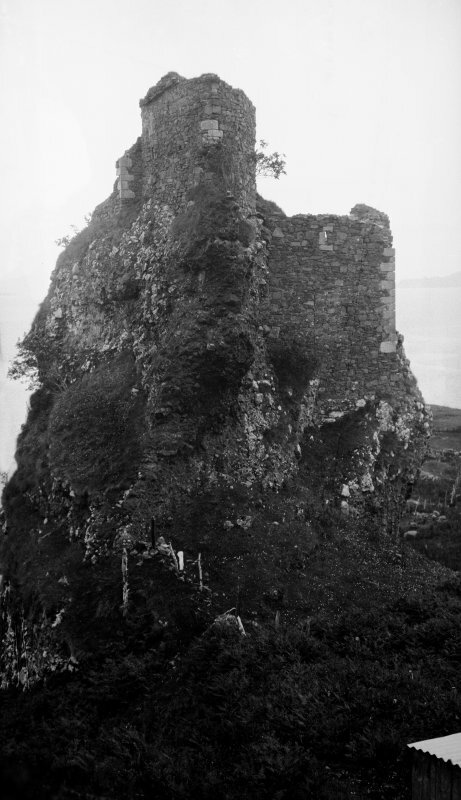 Brochel Castle. Interior. 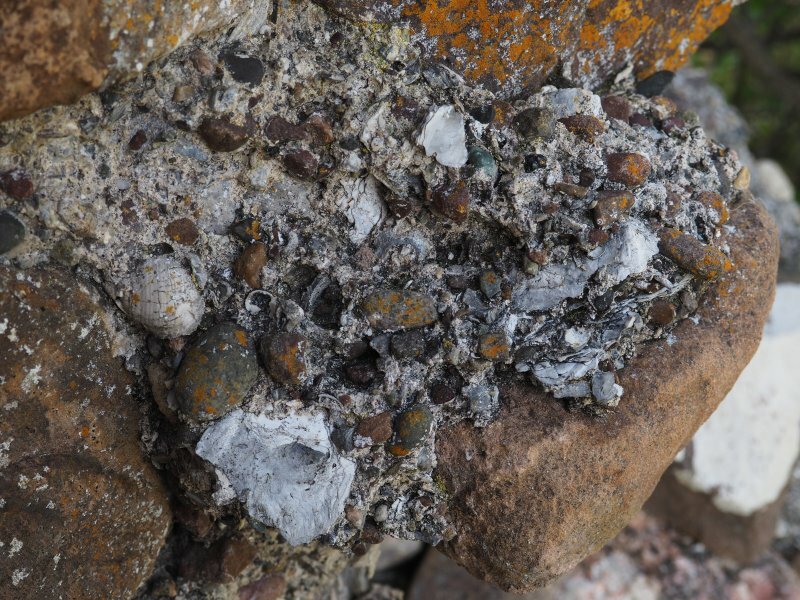 Detail of shell mortar in SE wall. 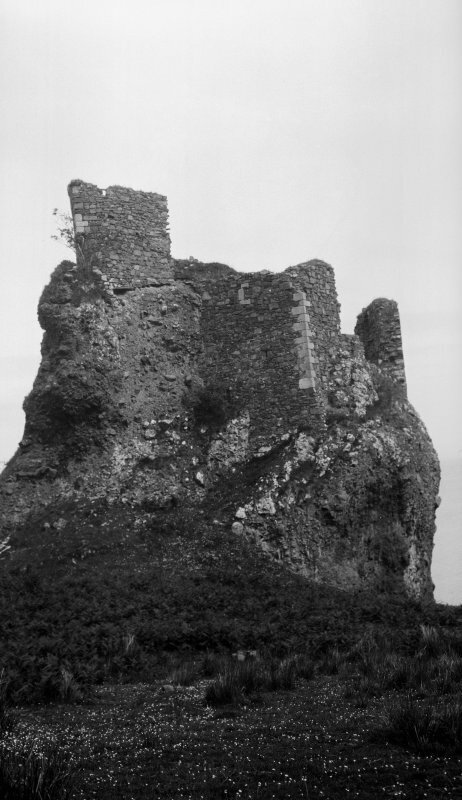 Brochel Castle. Exterior. 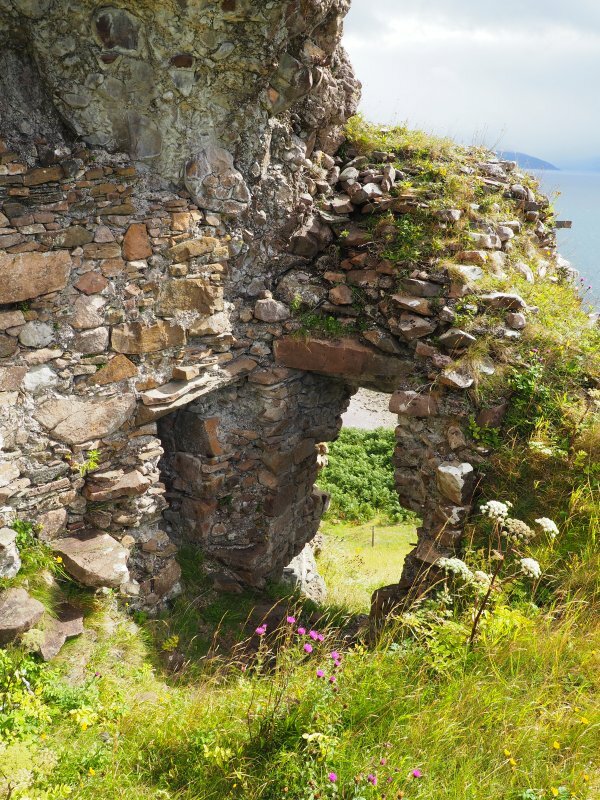 Entrance from E.
Brochel Castle, late 15th/early 16th century, occupied until c.1671 Ruin of impregnable stronghold on Raasay's north-eastern shore, an ingenious fusion of natural rock and masonry rising sheer from a stack-like volcanic plug some 15 m high. 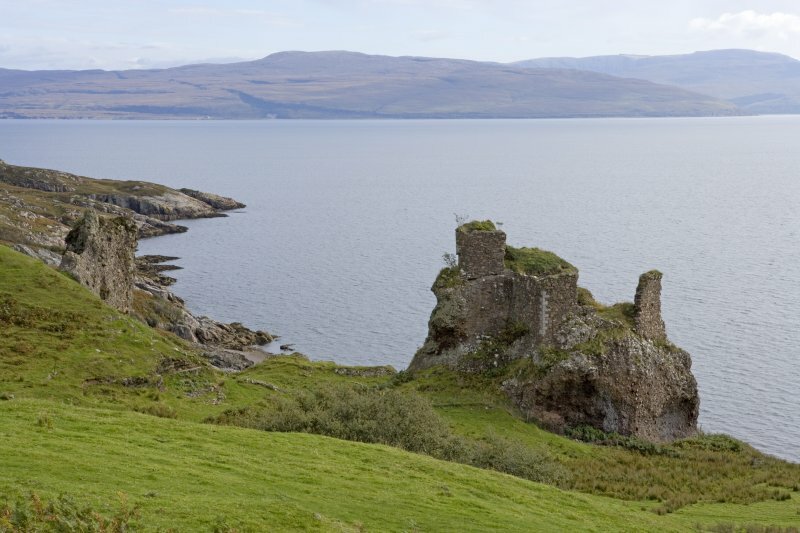 Built, so the favoured tradition goes, by Raasay's first Macleod chief, Calum (MacGilleChaluim), it provided a strategic base for a dynasty of reiving seadogs to control their mainland possessions and the Inner Sound. 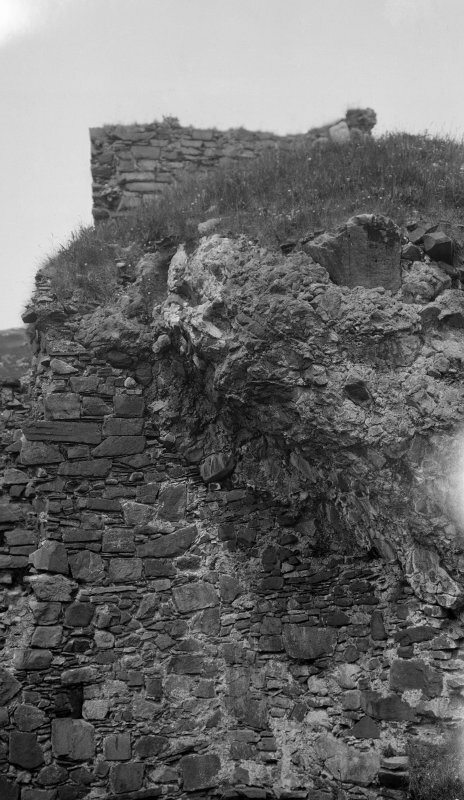 Even today, with masonry eroded to precarious stumps, it is easy to see why Brochel has often been depicted as something born of realms fantastical. 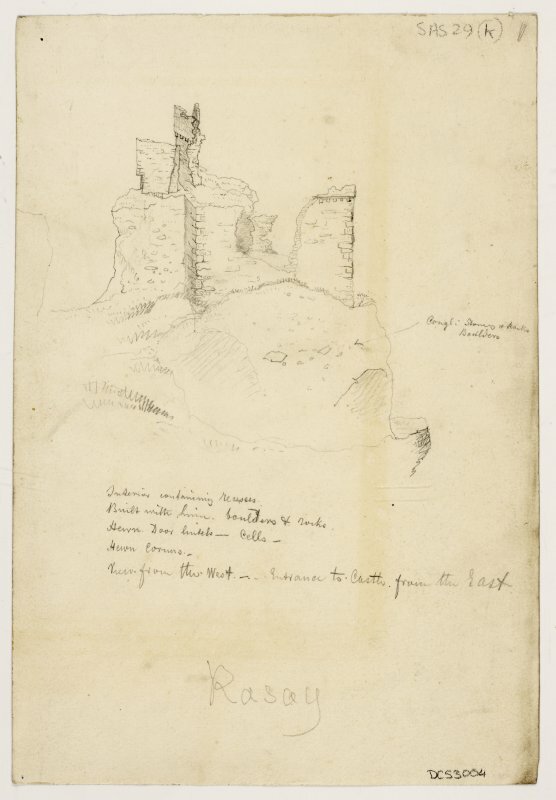 Though only footings survive of the tallest tower, which rose to corbelled battlements (Daniell's view of 1818 depicts it virtually intact), remnants of three other tower structures on different levels still conjure up a thrilling spectacle. 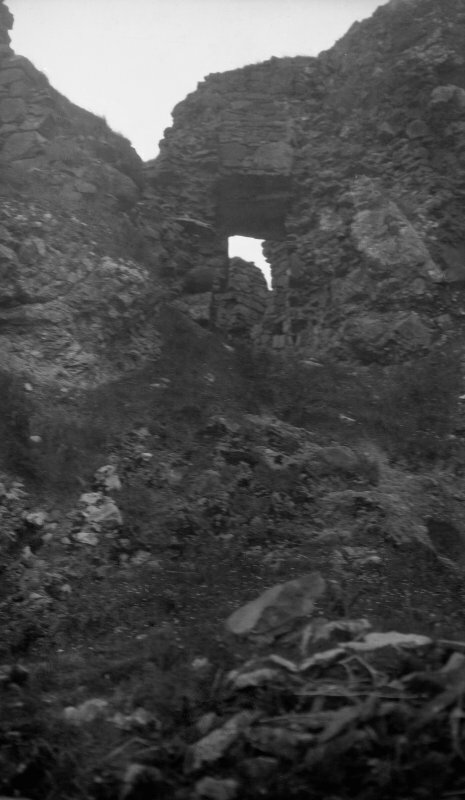 Entrance was via a steep ridge leading up from the east to a narrow cleft between projections of rock and masonry, with sheer drops on the other sides. 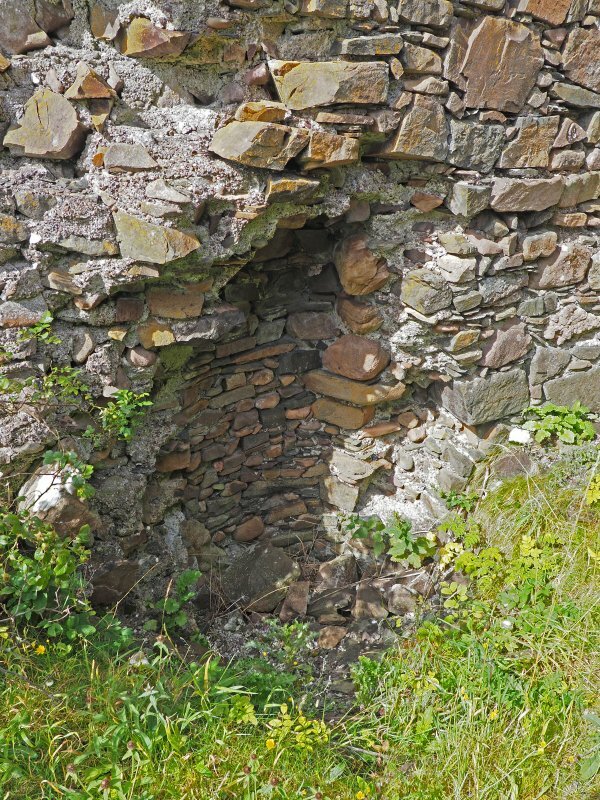 Boswell noted an 'opening in the wall from which hot water or stones could be thrown upon an invader' above the entrance passage, from which steps led up to an internal courtyard with a well. 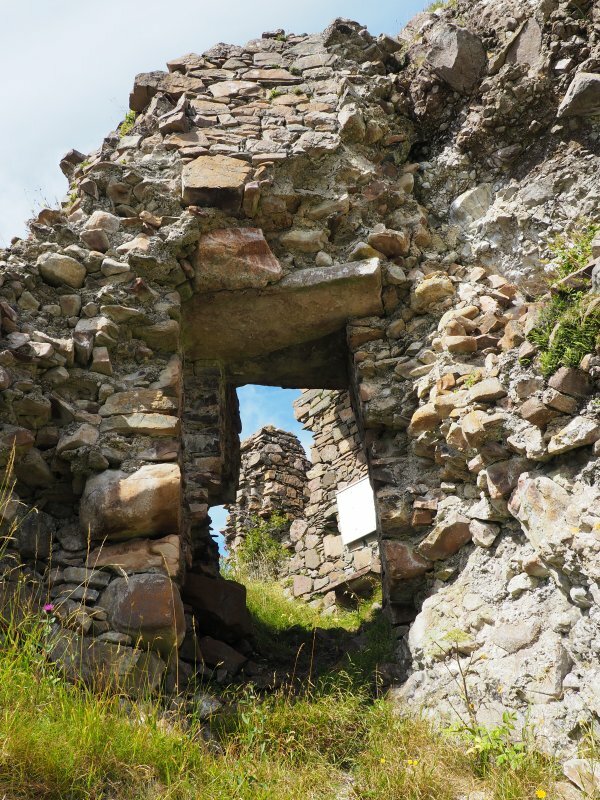 This open court was flanked on each side by a tower: the gabled south west tower containing kitchen with chamber above (still partly intact), and the south east tower, probably of two-stories, with a battlemented parapet (suggested by surviving fragments of corbelling). 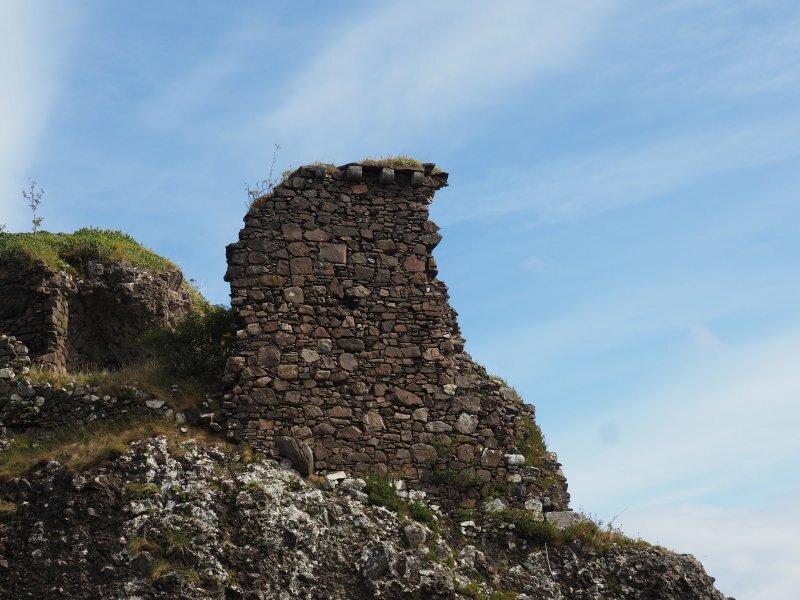 The best preserved tower stands prow-shaped to the north west, traces of its former subdivision still visible, as are recesses and a garderobe. 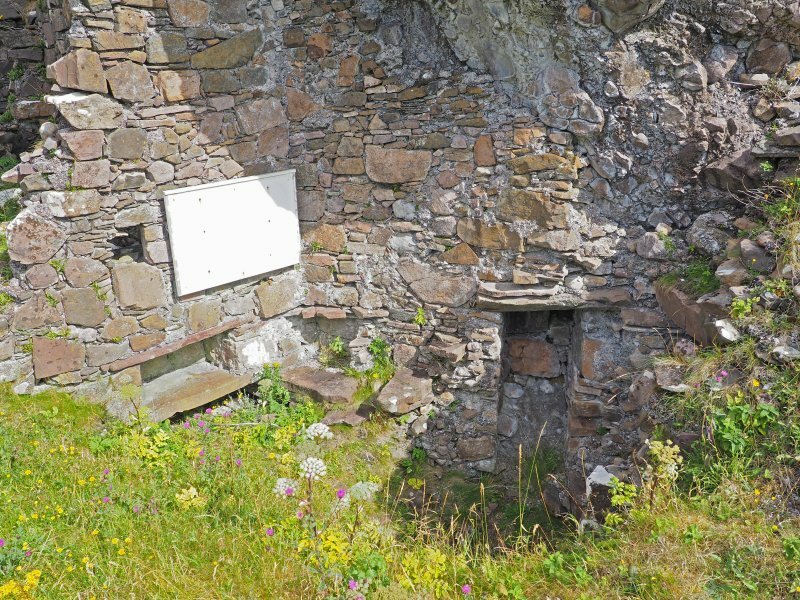 Some evidence in the form of small windows and fragments of stairway provides clues to the varying levels, and access thereto. 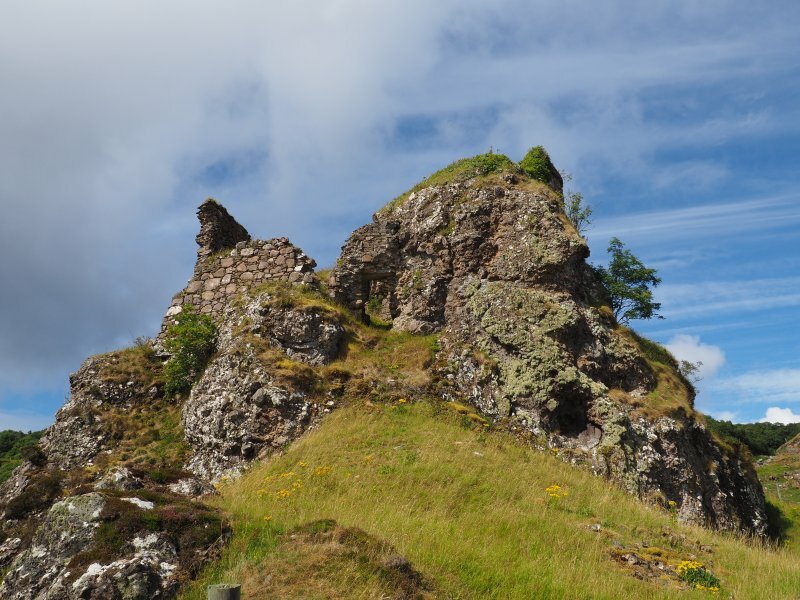 Sadly, ownership by Highland Council today has not ensured consolidation, and much debris has fallen from the shattered ruin to the base of its pinnacle. 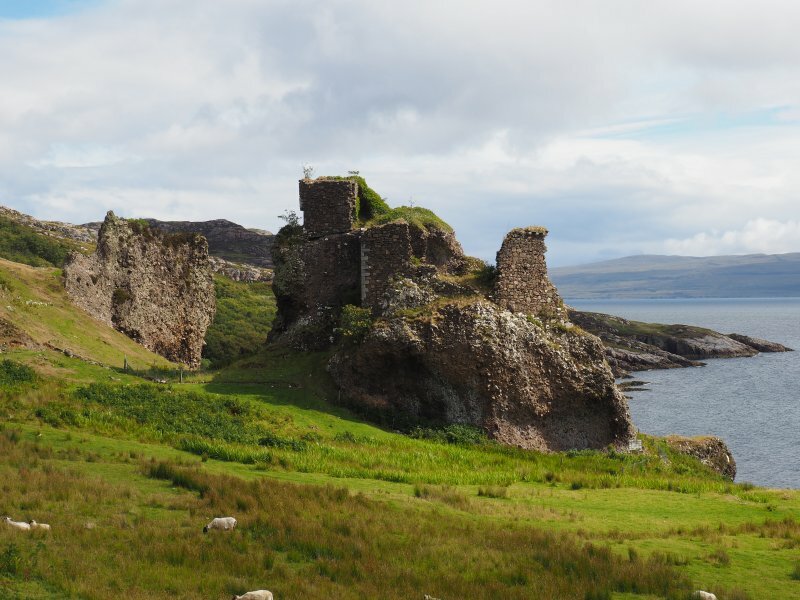 At its north end, Raasay twists into a rocky claw with three detached digits - Fladda, Eilean Tigh and Rona. For adjacent chapel, see NG54NE 5. OS 6" map, Inverness-shire, 2nd ed., (1904). Non-Guardship Sites Plan Collection, DC23119. 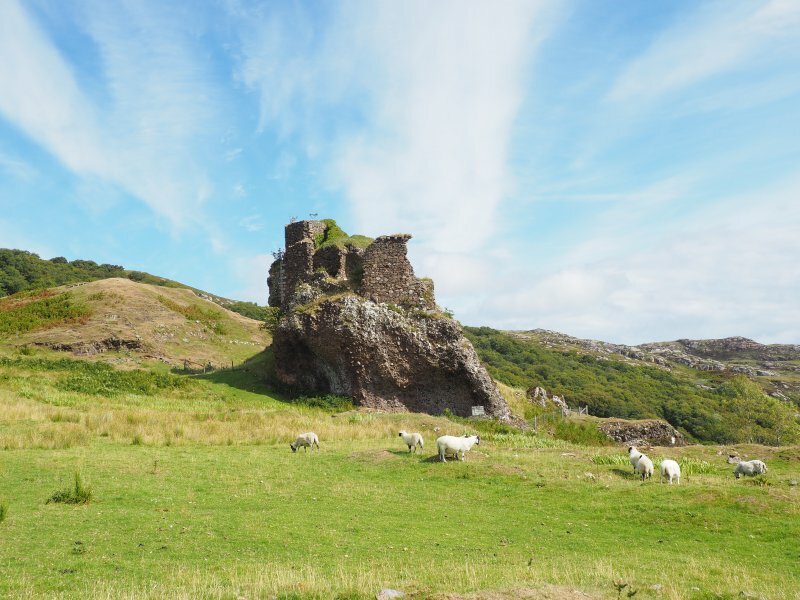 Brochel Castle was in existence in 1549, and perhaps as early as Duntulm Castle, ie. mid-15th century. 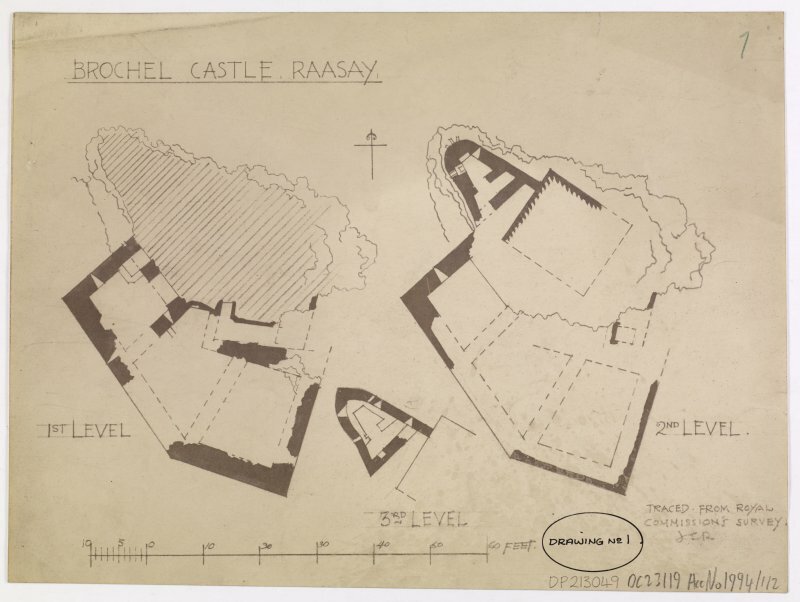 Full description in RCAHMS (1928). 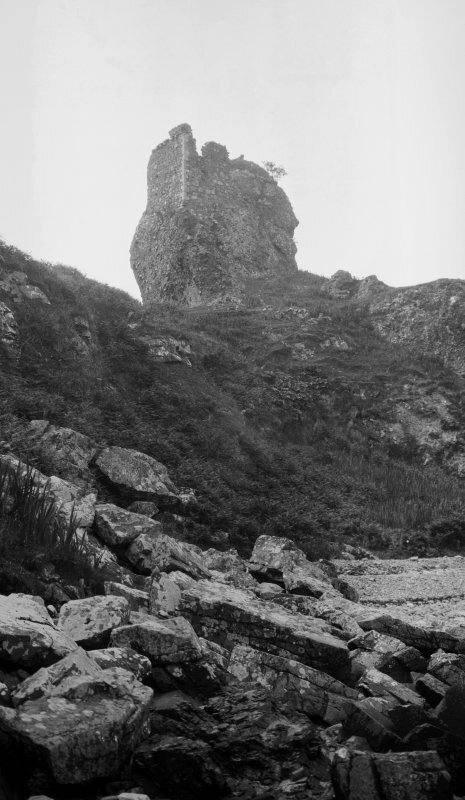 RCAHMS 1928; M Martin 1934; S Gordon 1935; S Gordon 1950. 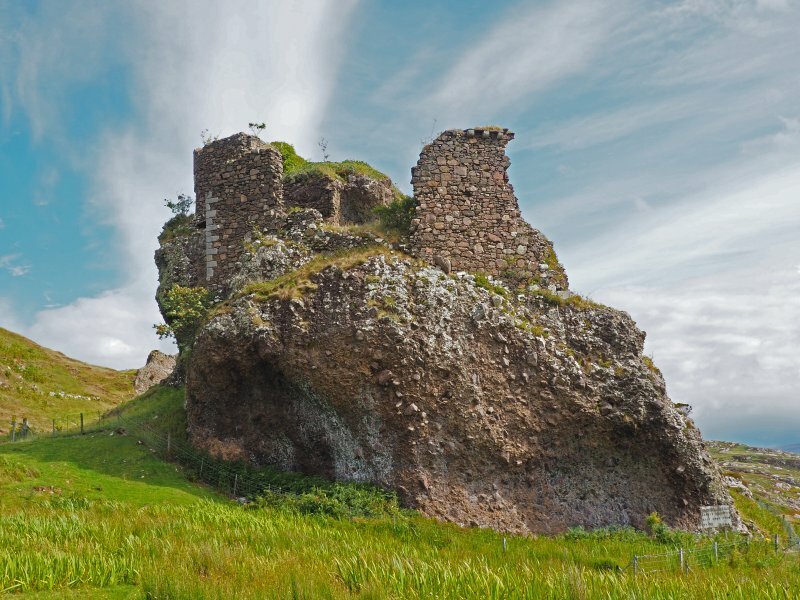 Brochel Castle, as planned and illustrated by RCAHMS, is in ruinous condition. Site recorded during the survey of the townships of Glame, Manish More, Brochel, and the farmsteads of Doire Domhain plus the surrounding area carried out by ACFA in April 1997. A full report has been lodged with the NMRS. 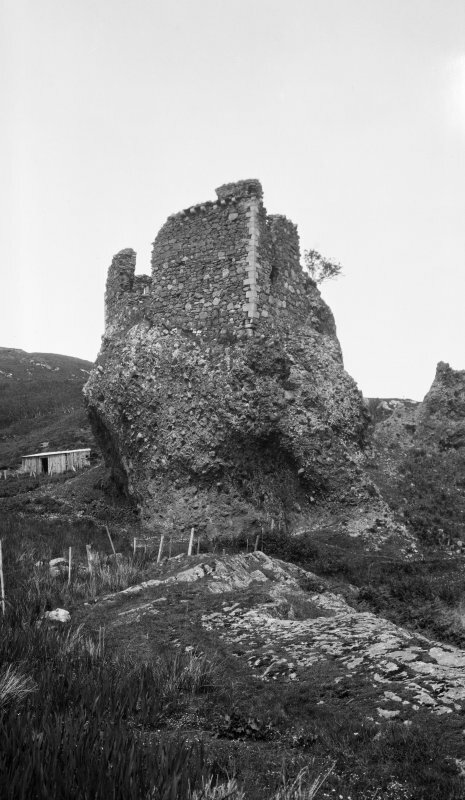 NG 5848 4627	Ruins of Brochel Castle reported in the RCAHMS 1928 inventory. Sponsors: Society of Antiquaries of Scotland, Glasgow Archaeological Society, CBA Challenge Funding. J Macdonald and J Scott Wood 1997.